Is this the ideal music server for first-timers and those who don't want to get bogged down with computers and networks? The Olive 03HD has a sharply focused band of customers in its sights. It wants to appeal to those people who realise that music stored on hard disk is definitely the way forward, but who have no inclination to become computer network aficionados and who simply do not want to mess about with computers. In short, it is a plug and play solution for those who have no idea what plug and play technology is, nor how it works. And the design could fairly be described as barebones. In fact, even an ardent technophobe ought to find it the simplest introduction they've ever come across to computer audio. The simplicity is evident the moment you unbox the 03HD. There's nothing to do, bar connecting the mains cable; fitting a pair of analogue interconnects between it and your amplifier and then connecting a Cat5 network patch cable, in order to give the unit access to your network and the internet. Power-up the Olive and it discovers the network automatically. There is no wireless connection with the 03HD, so that does away with one set-up complication for those who are not comfortable with networking. It also conveniently does away with problems that novice users might encounter with Wi-Fi , if they opted for it... but let us not get involved with the potential pitfalls of Wi-Fi, which is another story entirely. Those who do not enjoy using their laptops to poke around in a server's innards will simply use the integral CD ripper to copy CDs to the 500GB hard disk inside the 03HD. Choices of how you rip CDs can be made through the display, with uncompressed WAV for anyone who wants a smallish collection of pristine-quality files (around 1,500 CDs), or default-rate FLAC for those who are content with compressed (although not lossily compressed) archive-standard files. For those who are not unduly concerned about audio quality, the 03HD will also rip to 128-bit AAC, or 128/320-bit MP3. The internal DAC is a Cirrus Logic design, that will handle signals up to 24-bit/192kHz, even though CD rips on the 03HD will only be16-bit/44.1kHz. The unit can access shared network storage, where you might well have high-resolution downloads stored. Externally, there is little to distinguish the 03HD from the 4HD. The rake-fronted styling is the same, but the assembly of the 03HD is more cost-effective and the casework is steel rather than the aluminium used on the 4HD. There are also fewer connections and no digital or HDMI sockets. Olive felt that neither facility was appropriate for its target market. The 03HD has the same polished Maestro user interface as its more expensive big brother... but it feels slightly more responsive. There is also a free iPhone/iPad app for those who regard laziness as a full-time occupation. As seems to be the way with such apps, it is by far the easiest way to control players and servers. This unit is built down to a price, so one should not expect too much in the way of fantastic looks. In fact, a not-especially-close inspection reveals a host of screws (secure fastenings, is probably a better description) holding it together. As a result, two words spring to mind: Heath and Robinson. And donning an aesthete's cap we would certainly question the choice of gaudy Day-Glo yellow as the colour for the plastic surround to the CD loading slot. Internally, however, things look a lot better. There is a quality TEAC CD-RW mechanism for importing and exporting CDs and an ultra-quiet Western Digital AV hard disk for storing ripped CDs – up to 1,500 uncompressed albums. The CD-RW unit is also exceedingly quiet in operation: even when it's ripping a disc, the noise level barely reached 45dB at the mouth of the phlegm-coloured slot. By comparison, the fan in a laptop produces 55dB! Because there is an iPhone app to control the 03HD, you only really need access it to rip discs, so you could easily park it on the bottom shelf of your equipment rack if you want to hide it from view. Or you could simply buy the black version, where the fixings are not quite as obvious as they are on the silver version. The Olive 03HD (like its bigger brother, the 04HD) is a musically persuasive player, following in the British tradition of pace, rhythm and timing. However, it is also highly detailed in an American high-end fashion. All round, it is remarkably capable when you consider what it offers at its bargain-basement price. We were keen to test its performance with 24-bit/192kHz material stored on a NAS, which would show up any failings in the UPnP transport and DAC side of things. To do this, we played the William Carter album, Fernando Sor Early Works and found nothing about which to complain. The music played flawlessly with no glitches, stuttering or interruptions. It also displayed all its expected chiaroscuro and subtle drama and Carter's guitar technique was magnificently documented – his mastery of dynamics, was vividly portrayed. The distinctive timbre of his baroque instrument was beautifully rendered: even the sound of his fingers sliding along the neck and the harmonics he picks had their own characteristic and individual signatures. 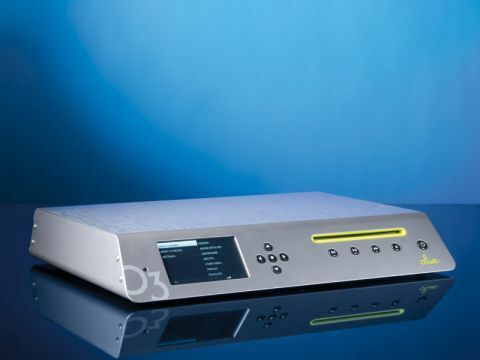 Bringing out the individual character of particular voices and instruments seems to be a strongpoint of the 03HD, something that was demonstrated by the 24-bit/96kHz recording of singer/songwriter Dawn Langstroth, Highwire. There was nothing forced or 'uncomfortable' about this detailing, because the voicing of the 03HD seemed ideally judged to let it all integrate perfectly: the highs, while being expressive and revealing were not too hot or oppressive, while the LF had a pleasant warmth and sense of power without being overwhelming, along with fine articulation. The 03HD maintains its balanced tonality and revealing, empathetic nature playing CD-resolution rips from its local hard disk. It easily discriminated between decent-quality and less well-recorded discs. Even so, it always does its best to reveal all the musical information and performance that it could scavenge. Finally, we appear to have neglected the internet radio facility, which is always a useful feature and one that sounds rather fine, if not truly audiophile quality, on the 03HD. It would be churlish to pick fault with the Olive 03HD. For not a great deal of money, you get a fine CD-ripper, very respectable playback quality and very decent sounding internet radio – at the higher data rates – thrown in for good measure. The CD storage will be adequate for most folks, but the 03HD will access network storage and play back from it – provided you can install Twonky media manager on the NAS, which is not difficult – so you have the facility for adding huge amounts of extra storage, if you need it.